Last night we walked for an hour or so and then had dinner at Le Bourbon, on the Place du Palais Bourbon in the 7th arrondissement. The Palais is where the National Assembly meets. 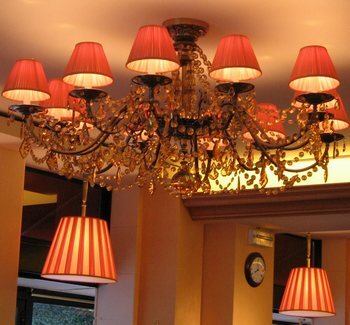 One of two chandeliers in Le Bourbon. 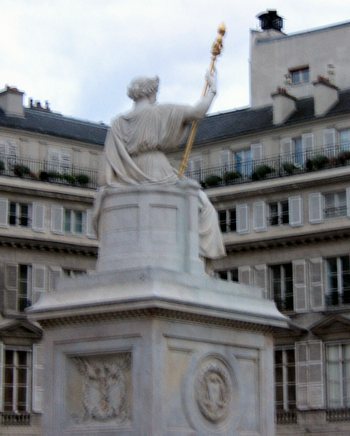 I love the Place du Palais Bourbon because it seems to be so old, and so dignified. It is an open space where you can breathe. I took this photo as it was getting dark, and I shot from the back because facing in the other direction, you would see all the scaffolding that now covers the Palais Bourbon. Next year, the Palais will probably be stunningly beautiful. 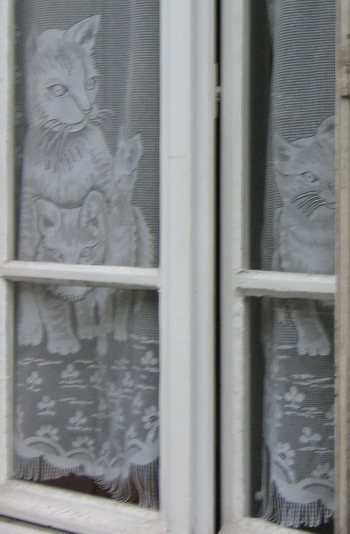 At right, cat lace curtains on the boulevard de la Tour Mauborg in the 7th arrondissment. The days are now noticeably shorter. Now, when we leave a restaurant at 9:30 or later (which is normal for us), we will be walking home in the dark, as we did last night. Paris is gorgeous at night. 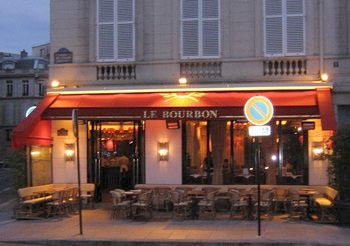 We went to Le Bourbon last night not for the food so much but for the great ambiance, both inside (check out the chandelier at left, below) and outside (the elegant Place du Palais Bourbon). In this restaurant, you might well run into fairly high level government officials, especially at lunch or at happy hour/tea time. It is not expensive. And it is not arrogant. The service is always friendly – at least it has been for us. The food is okay. Now that it is August, there is more room for us in these places at night, and reservations are not so necessary. Of course, many of our favorite places are closed for part or all of this month. It was so cool last night, I wore my not-so-lightweight Chicos jeans and jeans jacket, with the jacket snapped up most of the way. The weather now is perfect, and there will be no more heat waves this summer. And, good news, I hear there will probably be no monster hurricanes in Florida this season as well! We are definitely due for a break. Well, my French lesson in Le Parisien yesterday was the word “autocar.” An “autocar” is not a car, it is a bus. Evidently, there is a problem at this time of year in Europe when many people of North African (Maghreb) origin go back to visit families there. The cheapest way to go is for a group of people to hire a bus and driver from a fly-by-night operation that does not necessarily bother to adhere to rules such as weight limits. And the travelers want to take lots of goods back to their families in North Africa, so they have way too much luggage. These “autocars” often have a number of mechanical and/or safety problems as well, and when you combine all this with the horribly high rate of speed that is the routine on the European highways, the result is that people die. The route is typically through Spain and on to Morocco. So, on the major routes through France toward Spain, the French transportation authorities are now stopping and checking the “autocars.” Many are found to have safety violations, the most common being overloading. When caught, the fly-by-night company will send a couple small trucks to carry the excess luggage, and off they go. Even if they are fined 800 euros, they still make money because the typical profit on one of these trips is 2000 euros. Another sad seasonal problem is that some people go off on vacation and abandon their cats to the streets or parks. All of the animal shelters are now chock full of cats and dogs that have been abandoned this month.